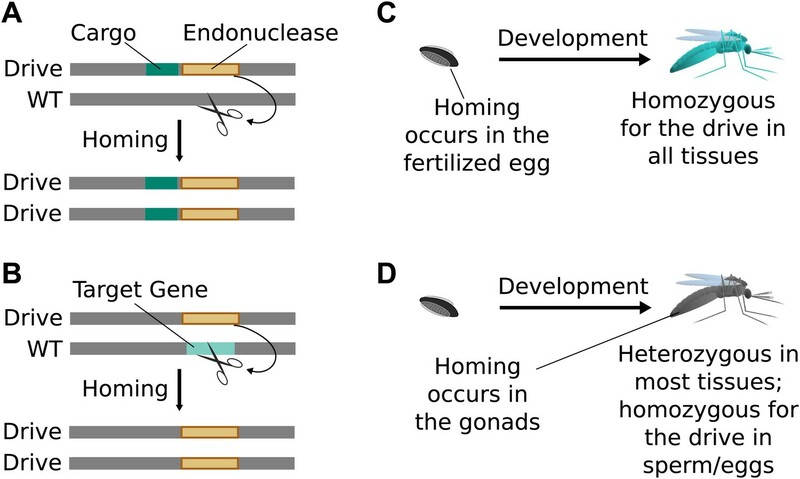 Enhancing drive copying by regulating endogenous genes. (A) Very short guide RNAs direct nuclease-active Cas9 to bind but not cut the corresponding protospacer (Sternberg et al., 2014). 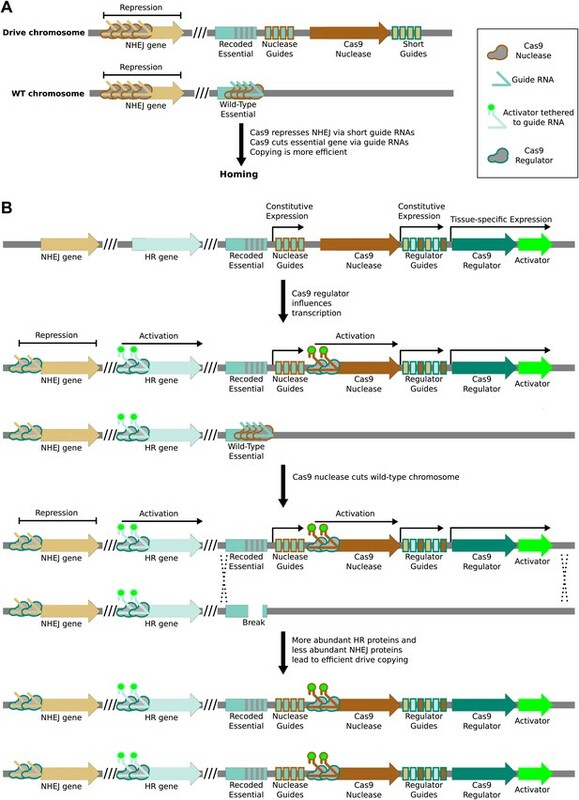 When bound near the promoter of a gene, Cas9 has been shown to repress transcription (Gilbert et al., 2013). Using the drive nuclease to repress key genes required for the non-homologous end-joining (NHEJ) pathway may increase the rate at which the drive is copied by boosting the effective rate of the competing homologous recombination (HR) pathway. (B) NHEJ genes could be repressed and HR genes activated in advance of cutting by employing an orthogonal nuclease-null Cas9 protein as a transcriptional regulator. The regulator would be expressed in the desired germline stage using an appropriate tissue-specific promoter and repress NHEJ genes by simple binding. HR genes could be simultaneously activated using guide RNAs featuring additional 3′ hairpins that bind a transcriptional activator expressed separately (Mali et al., 2013a), or by using a separate orthogonal Cas9. 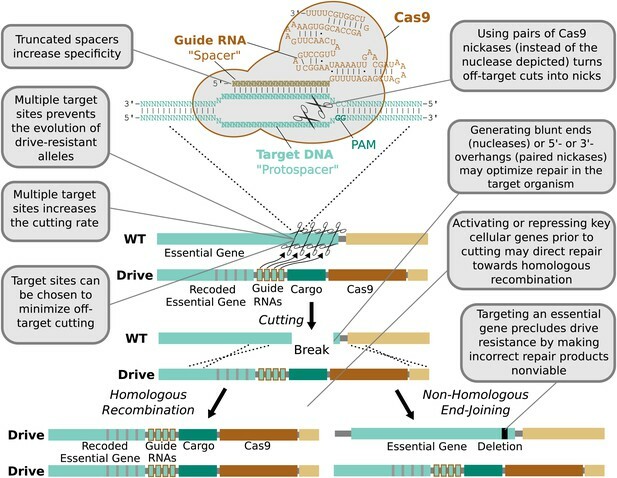 To ensure that modulation of repair pathways is coincident with cutting, the regulator might similarly activate transcription of the drive nuclease. Regulation will be evolutionarily stable during the lifetime of the drive if the drive nuclease requires the regulator for proper expression. Repetitiveness and evolutionary stability of multiple guide RNAs. (A) Homologous recombination between repetitive DNA sequences can lead to instability. 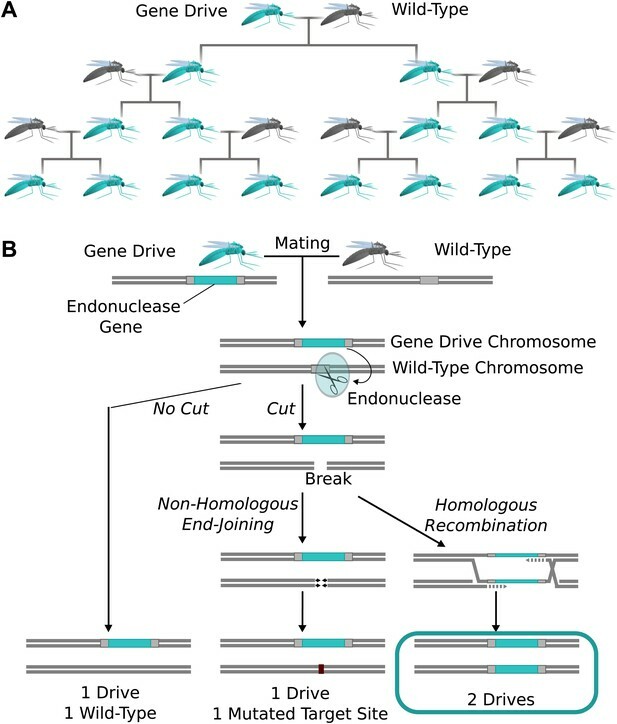 Attempts to build zinc-finger and TALEN gene drives demonstrated that repeated components are severely unstable during drive copying, possibly due to the single-strand annealing pathway (Simoni et al., 2014). 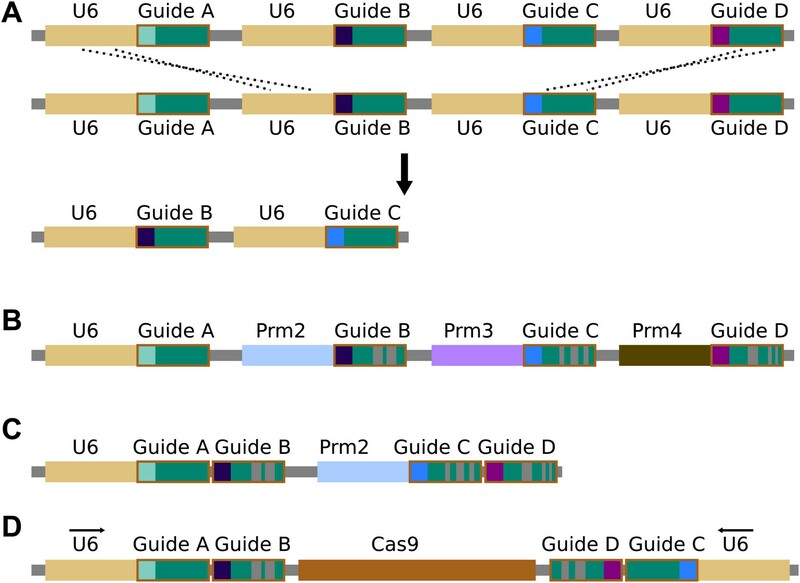 While the cas9 gene itself has no repeats, recombination between guide RNA cassettes or guide RNA promoters, most commonly the U6 promoter, is a possibility. (B) Using multiple guide RNAs with differing sequences that are known to retain function could reduce homology and thereby prevent instability. The length of the hairpin created by fusing the bacterial tracrRNA and crRNA can be varied by more than a dozen bases with equivalent activity (Esvelt et al., 2013), while tracrRNA equivalents from closely related bacteria can be substituted (Fonfara et al., 2013). Similar alterations could presumably be discovered through experimentation (Nishimasu et al., 2014). Together, these allow the creation of many different functional guide RNA sequences that do not share more than a few dozen bases of homology. Homology in the promoters used for guide RNA expression might be similarly reduced by employing different Polymerase III promoters; several of which are typically present in each species (Friedland et al., 2013; Dickinson et al., 2013; Nissim et al., 1016). (C) To reduce the requirement for multiple promoters, studies have shown that more than one guide RNAs can be expressed from a single promoter in various ways (Tsai et al., 2014; Nissim et al., 1016). If cutting is already highly efficient, strategies that utilize RNA polymerase II promoters that typically exhibit reduced cutting efficiency may represent alternatives (Nissim et al., 1016). (D) The total number of guides and promoters can be doubled without notably decreasing stability by arranging them in two inverted groups on opposite sides of the drive. 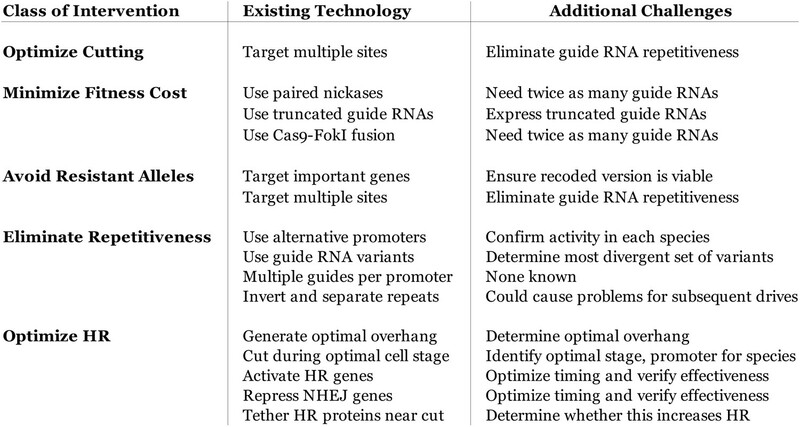 Finally, guide RNA engineering and improvement is an extremely active area of research; if current solutions prove to be inadequate, it is likely that alternatives will soon become available. 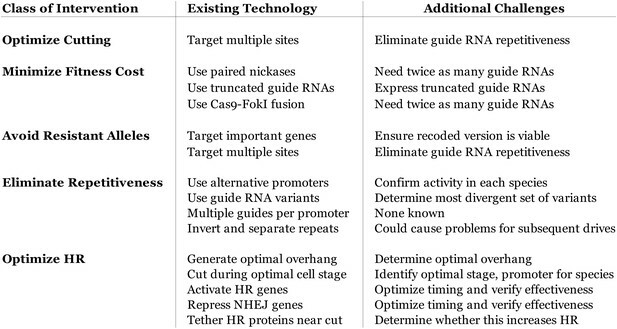 Table of known technological advances that might be adapted to optimize gene drive efficiency. Off-target fitness cost, Cas9 cutting efficacy, and correct drive copying by homologous recombination (HR) are the primary determinants of drive fitness. 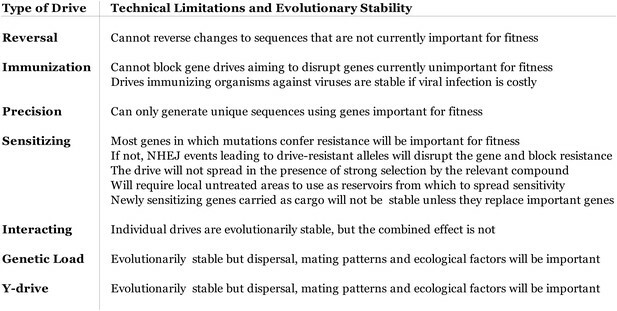 The ideal standard gene drive confers an effective fitness benefit of 100%, as it is transmitted to twice as many progeny with no fitness cost. The fitness of suppression drives is more complicated due to species-specific density and resource-dependence and mating dynamics and must be considered on a case-by-case basis. The most challenging problem at the molecular scale concerns the highly variable rates of homologous recombination (HR) relative to non-homologous end-joining (NHEJ) in different species, cell types, and developmental stages. Cas9 cutting should ideally occur during a stage featuring efficient HR and minimal NHEJ to maximize fitness. Within the germline, homologous recombination rates are normally highest in the oocyte because NHEJ is nearly absent in that cell type. As development progresses, the incidence of NHEJ rises sharply even if the HR machinery remains active. For this reason, we anticipate that maternally transmitted drives that both cut and are copied into the paternal chromosome in the zygote will be among the most efficient. Paternally transmitted drives cannot cut the maternal chromosome until they are expressed, which occurs at different times in different species. Those species that initiate transcription comparatively early, such as mice, are likely to be more amenable to gene drives than those that begin late, such as Drosophila. However, this does not necessarily imply that HR occurs at low efficiency in Drosophila embryos; injecting Cas9 and guide RNA-encoding plasmids along with a template to be copied yielded correct insertions in 13/16 embryos (Gratz et al., 2013). In contrast, injecting Cas9 and guide RNAs targeting two genes along with templates for repair into mouse embryos yielded 7/10 pups with the first insertion and 8/10 with the second insertion, with six of those having both; all other mice utilized NHEJ. We suspect that while drive copying rates will be difficult to predict in advance in a given species, any drive constructed with a housekeeping, viral, or strong germline promoter is likely to function reasonably well due to the combination of highly efficient maternal copying and moderate paternal copying in the zygote and early embryo. Germline copying can also occur later in development for standard drives. The difference between achiasmate species with low HR rates during meiosis, at least in males, and chiasmate species is likely to be crucial. The difference is clearly demonstrated by comparing the Anopheles drive, which exhibited 97% HR and a fitness benefit over 50% (25% given its restriction to males) (Windbichler et al., 2011), to the equivalent Drosophila drive, which exhibited 71% HR and an effective fitness benefit of 32% (54% homing–22% NHEJ; a 16% benefit given its restriction to males) only after extensive optimization (Chan et al., 2013b). 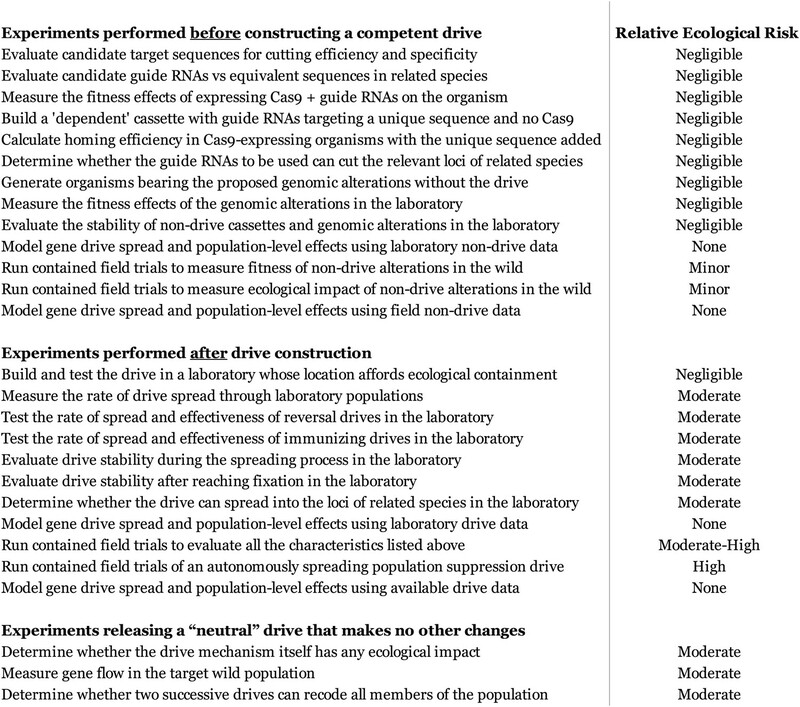 The latter was improved from an initial construct demonstrating only 35% HR (Chan et al., 2011), which is insufficient to generate a fitness benefit if targeting an essential gene and will generate more resistant alleles than copies of the drive if not. Limiting expression to the late germline may be very effective, but early germline or especially oocytic expression may be superior depending on the species. 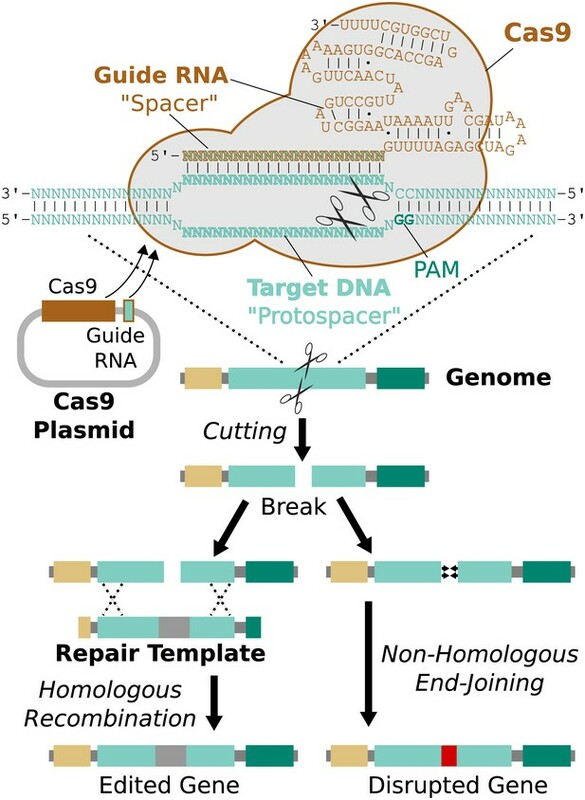 Finally, it may be possible to repress genes required for the competing non-homologous end-joining pathway using Cas9 in order to boost the effective homologous recombination rate in a particular germline stage (Figure 4—figure supplement 1). Genes responsible for homologous recombination might be activated in a similar manner. The main question is whether the resulting changes in protein abundance will occur quickly enough to influence drive copying. Sample interacting drives that produce a sterile-daughter effect. 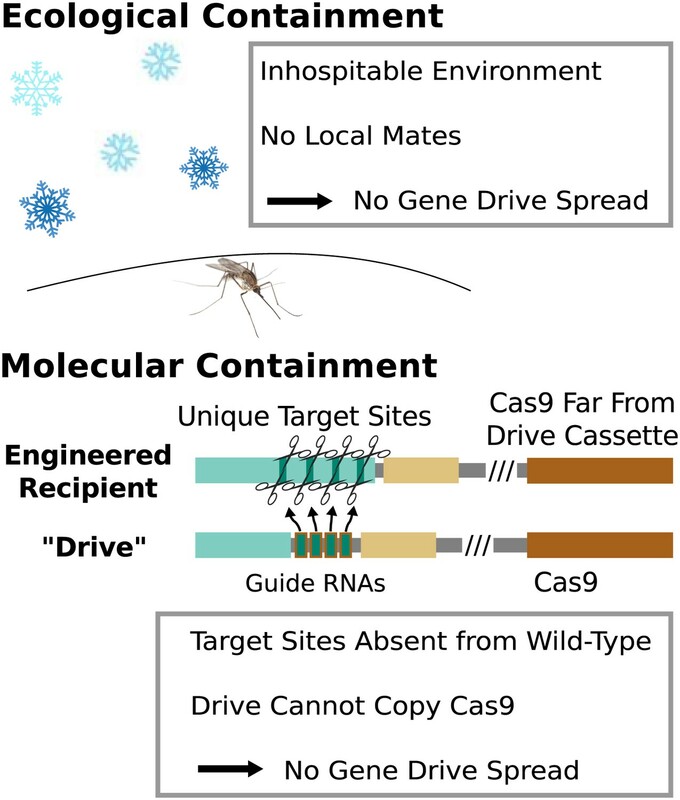 (A) Drive A spreads through the wild-type population without any phenotypic effect using Cas9-A and guide RNAs A-E (essential). It also carries guide RNAs B-F (fertility), which cannot be utilized by Cas9-A. (B) Drive B spreads through the wild-type population without any phenotypic effect using Cas9-B and guide RNAs B-E (essential). It also carries guide RNAs A-F (fertility), which cannot be utilized by Cas9-B. Cas9-A and Cas9-B are orthogonal in that they do not recognize one another's guide RNAs. (C) When organisms bearing Drives A and B are crossed, offspring inherit one copy of each. Both drives are copied as normal. 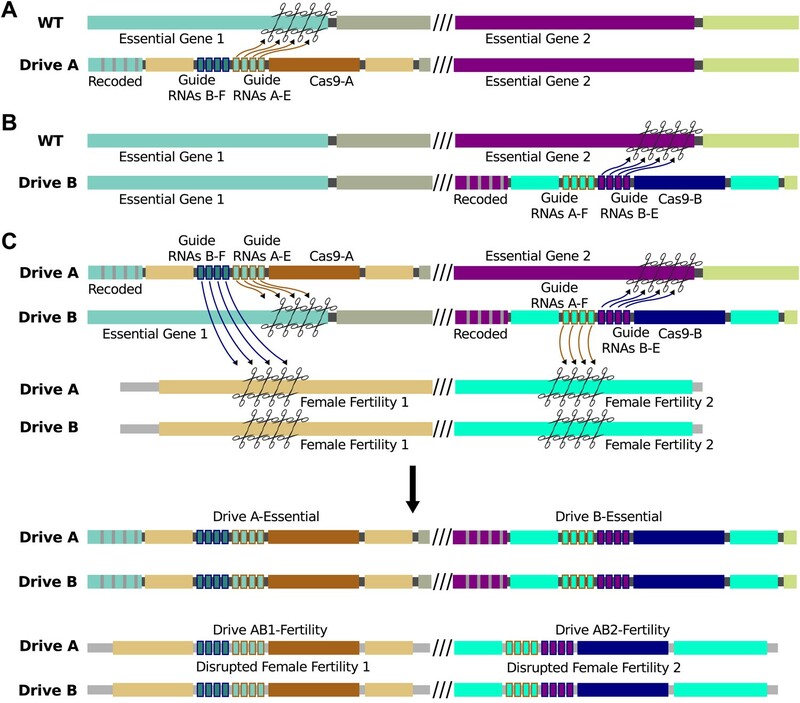 In addition, Cas9-A (from Drive A) uses guide RNAs A-F (from Drive B) to cut a gene essential for female fertility, while Cas9-B (from Drive B) does the same using guide RNAs-B-F (from Drive A) to cut a different gene. Drives A and B have internal homology appropriate to be copied into these cut fertility genes, disrupting them and causing infertility in females. If all repairs are conducted via homologous recombination, there are now four drives: A, B, AB1, and AB2. In reality, recombination between the non-homologous chromosomes is likely to be less efficient, causing loss of the female fertility genes but not explicit copying of AB1 and/or AB2. The phenotypic effect is identical. An extreme example of ecological management: the use of suppression and immunizing drives to control rat populations worldwide. Releasing Y-Drive-SD (male-biasing sterile-daughter) rats into invasive rat populations would initiate local eradication while an immunizing drive protectively recoded the native rat populations of Eurasia. Stowaway-mediated gene flow, depicted as a border of Y-Drive-SD framing Eurasia, will result in local population suppression due to the sterile-daughter effect that would remain when the drives interacted, limiting the ability of either population to invade the other. This control process would have to be repeated with new drives once recoded stowaways successfully re-invade the rat-free habitats. Because of the complexity of gene flow patterns in rats, the uncertainty of whether a Y-Drive-SD would be effective, and the possibility for adverse human intervention, controlling rat populations in this way will not be feasible any time within the next decade and possibly not at all, but it provides a useful world-spanning example of a possible drive-based solution aiming to solve a serious global problem. Relying on precision drives to give specific invasive rat populations unique genetic markers (Figure 5C) for subsequent targeting with precision suppression drives or utilizing weaker suppression drive types (Figure 6) may represent more feasible alternatives. Characteristics of population suppression drives. The optimal suppression drive for a given population will be highly species- and situation-dependent. 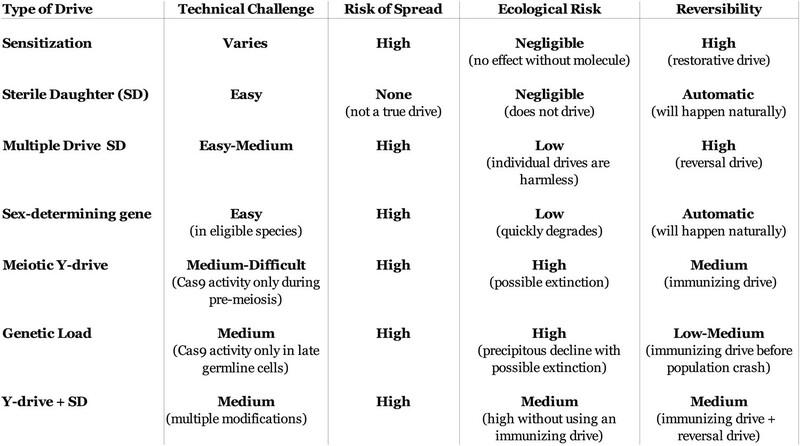 In species with poorly understood genetics, more technically challenging drives may not be an option. While all true drives risk spreading into non-target populations with compatible sequences, the ecological risks to those populations vary. 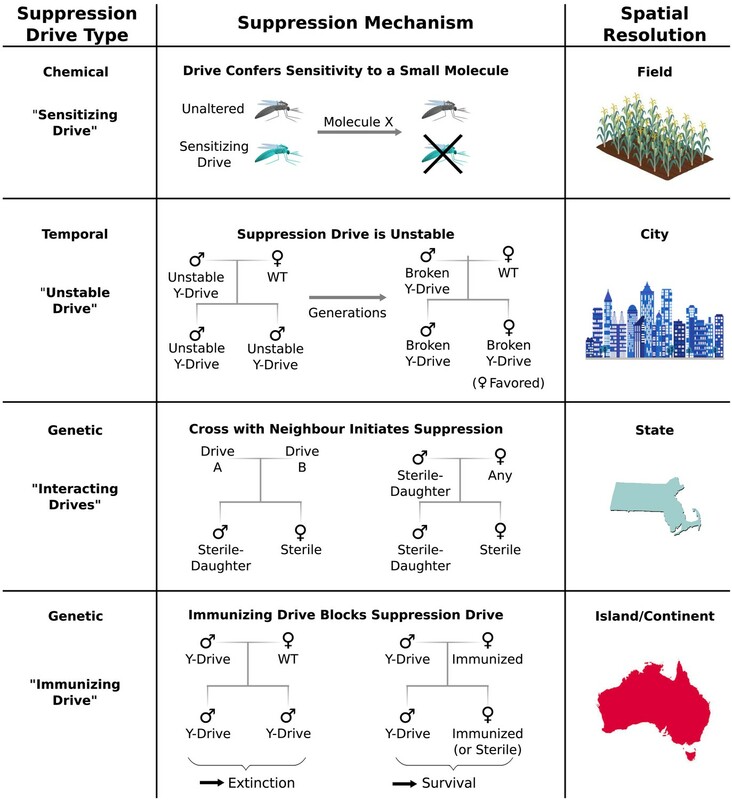 For some drives, a single individual escaping to a non-target population could cause widespread population suppression or even extinction, while others would require multiple sequential escapees of particular drive types. 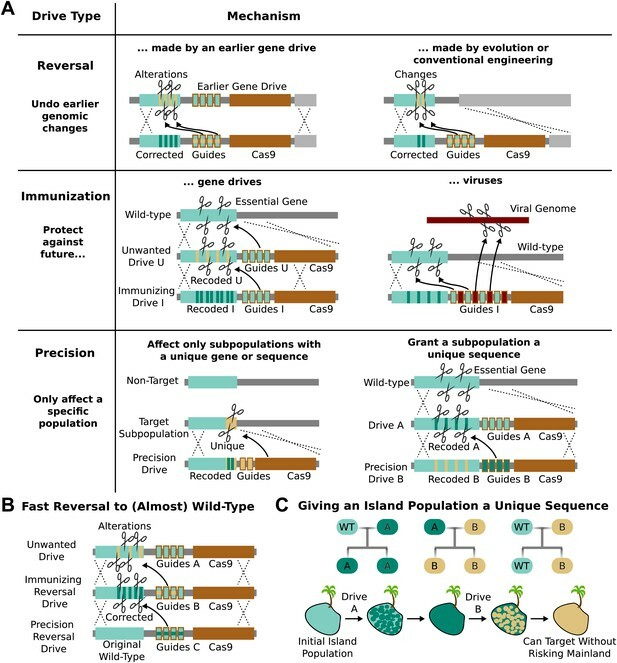 Some drives will be quickly eliminated by natural selection if not continually re-released, others would require a reversal drive to restore the wild-type sequence but should not have any phenotypic effects, and the most aggressive would require a suitable immunizing drive to be released within a certain timeframe in order to prevent a population crash. All of these risks could be mitigated by first recoding the target population to create a unique target sequence using successive standard drives (Figure 5A–B). 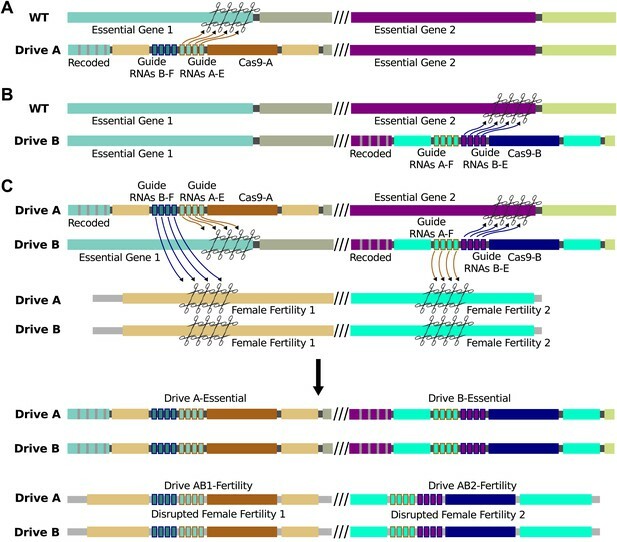 ‘Sterile-daughter’ refers to a drive cassette that causes female infertility analogous to Drives AB1 and AB2 in Figure 6—figure supplement 1; because its fitness will be at most 50% of a standard gene, it cannot exhibit true drive. 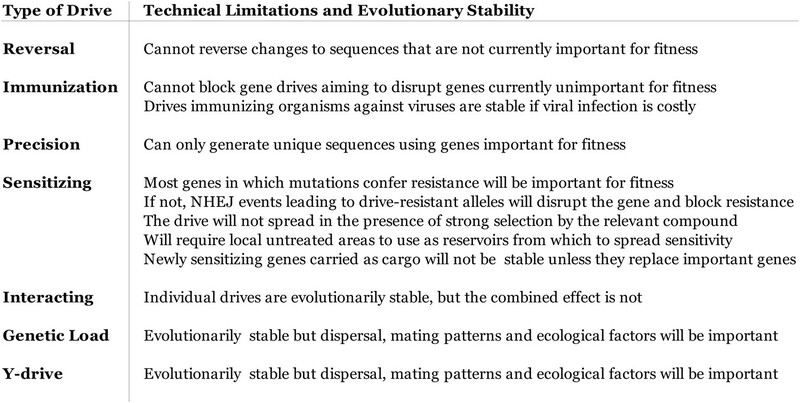 Technical limitations of different gene drive architectures with implications for various applications. In addition to those listed above, an RNA-guided gene drive spreading through a population will be under selection to maintain the function of Cas9 and the guide RNAs, as any nonfunctional mutants will lose their inheritance advantage. This selective pressure is restricted to components that relate to drive function or efficiency and will only last for as long as the drive spreads. Once it reaches fixation, any mutations that can increase fitness by inactivating the drive components will be favored. Estimated ecological risk of experiments during RNA-guided gene drive development. 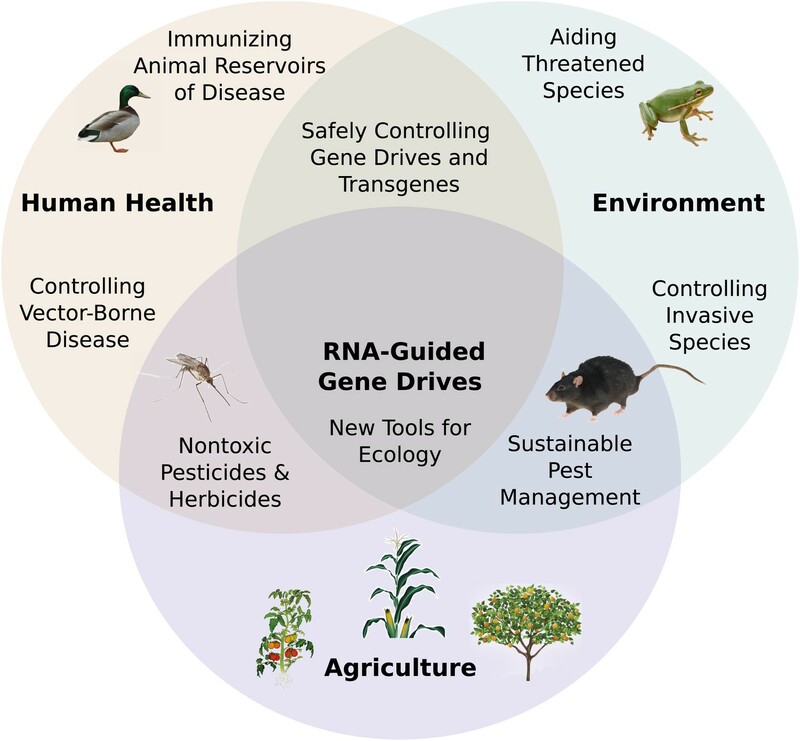 This should not be considered an exhaustive list, but includes many relevant experiments that might be performed during the development of an RNA-guided gene drive of any type. The assessment of ecological risk is intended to be a guideline only and will vary with the purpose of the drive. For example, releasing a laboratory-tested ‘neutral’ drive that is intended to cause no changes in organism phenotype beyond spreading its cas9 gene, guide RNAs, and recoded essential gene through the population is listed as a moderate risk because it will certainly edit a wild population, but in a way that is comparatively unlikely to affect its interactions with the ecosystem. Contained field trials of drives that do cause phenotypic changes are listed as moderate-high risk due to the very real possibility of a containment breach and subsequent unintentional population engineering; a standard drive with few or no expected phenotypic effects would represent a moderate risk, while a suppression drive would represent a high risk.